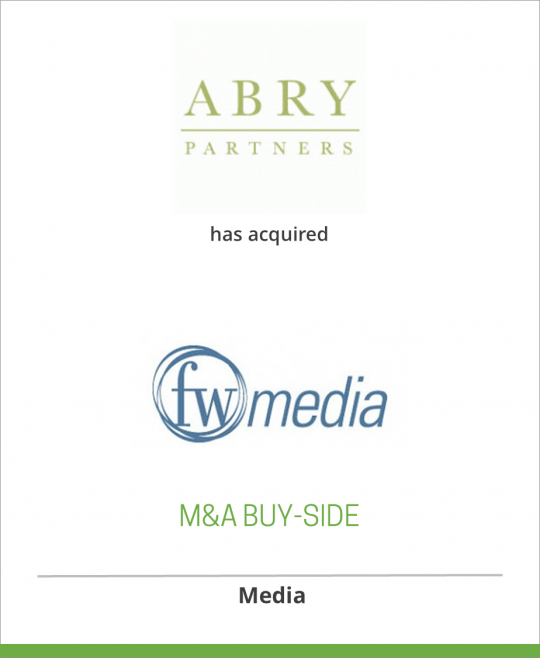 ABRY Partners has acquired F+W Publications, a publisher and marketer of magazines, books, book clubs and conferences, from Providence Equity Partners Inc.
F+W Publications (“F+W”), founded in 1913, is based in Cincinnati, Ohio. F+W’s publishing programs focus on consumer enthusiast and hobbyist markets providing value added content across multiple platforms. F+W has over 200 media properties across its special interest categories with 1.9 million active magazine subscribers and books sold in the US and internationally. The publications of F+W typically hold leadership positions in their respective segments with recognizable and trusted brands. Representative segments include: Writing, Outdoor, Log Homes, Scrapbooking, Guns & Knives and Sports (for more information, visit www.fwpublications.com). Providence Equity Partners Inc. acquired F+W in partnership with William F. Reilly and existing management in February 2002. Providence Equity is a private investment firm specializing in equity investments in communications and media companies and has made over $9.0 billion in equity commitments (for more information, visit www.provequity.com). ABRY Partners, based in Boston, is one of the oldest and largest private equity funds in North America investing exclusively in media and communications companies. ABRY has over $7.0 billion of assets under management and since 1989 has completed over $18.0 billion of leveraged transactions in the media and communications industries (for more information, visit www.abry.com). ABRY partnered with David Steward, the new CEO, who has over 20 years experience in publishing and direct marketing. Mr. Steward is the former COO and President of Publishing of Martha Stewart Omnimedia and most recently was CEO of International Masters Publishers, a direct marketing company. Mr. Steward also formerly served as President of TV Guide Magazine.